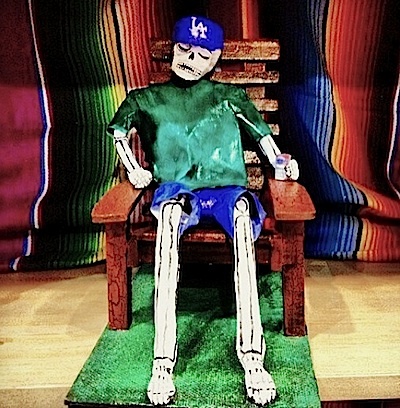 It’s Día de Los Muertos (Day of the Dead) and for die-hard Los Angeles Dodger fans, tonight’s decisive seventh game of the World Series against the Houston Astros has been a long time coming. A cultural tradition among Latinos that has grown in popularity all across the country, including here in the Los Angeles region, Día de Los Muertos is a celebration of loved ones no longer here: It’s a joyous celebration and belief that the person’s spirit lives on after their bodies are long gone. The Dodgers are seeking their first title since 1988 and the Astros their first-ever national championship. For many of those who will watch tonight’s pivotal game at Dodger Stadium, the game shows the Dodger glory of old has been reborn. “This has been an incredible series,” Candace Morelos told EGP. “”I’m lucky I haven’t had a heart attack, that’s what a roller coaster ride it’s been,” the 41-year-old Lincoln Heights resident said, adding she will watch the game on television because she couldn’t afford to buy tickets. “Maybe that’s better, because I get to watch it with my Pop, he’s been in love with the Dodgers since he came from Mexico in 1972, and made us love them too,” Morelos said while pumping gas this morning. The Dodgers tied the best-of-seven series at three games a piece Tuesday with a 3-1 victory as four relievers shut out the Astros over the final 4 1/3 innings, limiting them to two hits, and Joc Pederson hit a solo homer in the seventh inning for an insurance run. Yu Darvish will pitch for the Dodgers tonight against fellow right-hander Lance McCullers Jr.
McCullers was the winning pitcher and Darvish the loser in Houston’s 5-3 victory in Game 3 Friday at Houston. McCullers allowed three runs and four hits in 5 1/3 innings, striking out three and walking four, before being relieved by right-hander Brad Peacock, who held the Dodgers hitless over the final 3 2/3 innings. Darvish allowed four runs and six hits in 1 2/3 innings, the shortest outing in his major league career, which began in 2012. “If it was the regular season, I probably would’ve (kept) going,” Darvish said through a translator. The are a lot of “firsts” going into tonight’s game. This is the first time the seventh game of the World Series has been played at Dodger Stadium, which opened in 1962. This will be the Dodgers first World Series Game 7 since 1965 when Sandy Koufax pitched a three-hitter, striking out 10, in a 2-0 victory over the host Minnesota Twins. This will be the third time a World Series will conclude at Dodger Stadium. It happened previously in 1963, when the Dodgers swept the Yankees, and in 1978, when the Dodgers lost to the Yankees in six games. This will also be the first time either team has played in November. This is the sixth Series to extend into November, including each of the last two. This was the first time the Dodgers have played a World Series game on Halloween and the fifth all-time. 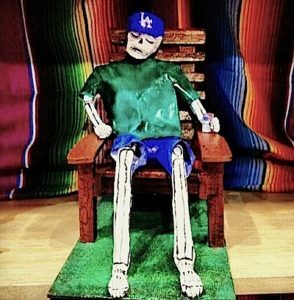 For the Dodgers’ large Latino fan base, many who lovingly refer to the team as “Los Doyers,” a win on Día de Los Muertos will forever earn them a place on altars for their beloveds. Information from City News Service writer Steven Herbert was used in the report. November 1, 2017 Copyright © 2012 Eastern Group Publications, Inc.